Between the wedding venues, cocktail dresses, cake samples and late-night Pinterest inspiration, nuptials are certainly stressful for the bride-to-be. But once invitations start landing in mailboxes, the stress is passed along to friends who are now standing in front of their closets wondering what to wear. Buying a new frock for each event isn’t realistic for most of us. It’s a much more modern – and fiscally responsible – approach to choose one beautiful, versatile vintage dress. I’m fond of this brocade stunner from J.Crew that goes from destination wedding to formal affair with ease. For the beach: Pair the dress with a raffia clutch (you could splurge on the Anya Hindmarch version or go with a ultra-affordable vintage one on eBay), a bold boho necklace and flat metallic sandals. For a formal affair: Refined shapes in punchy colors keep your look for being too stuffy. Try a pair of pumps in a matching color, introduce a contrasting color with your clutch, and top it off with dainty earrings and a cocktail ring. This post is a courtesy of Venuefinder. My brother brought back some Iraq money from his last tour of duty. The details and colors are lovely. Buds have already burst into blossoms and birds are coaxing you out of bed at dawn, but spring isn’t in full bloom until one more telltale sign: the first nuptial announcement lands in your mailbox. 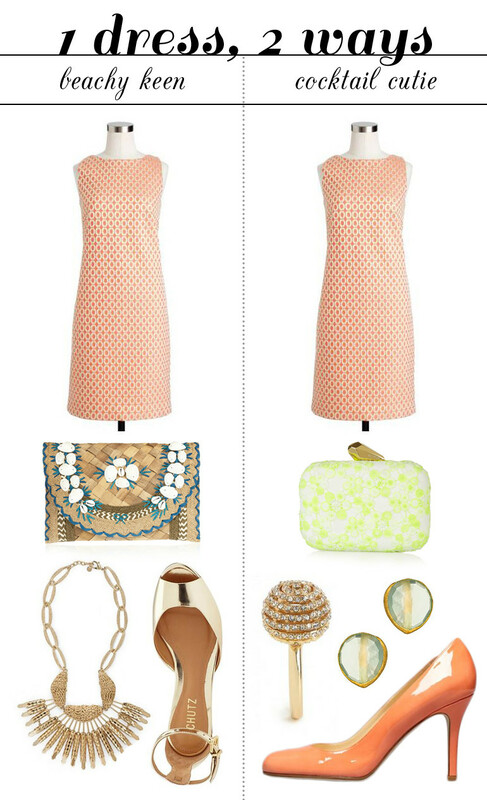 Pluck a dress from your closet and transform it with accessories. Statement baubles and glittery shoes do wonders. Bypass the designer duds in favor of a pretty mid-priced dress, like one from the Oasis clothes collection. Swap dresses with a friend. After all, her family has already seen the cocktail dress she wore to her cousin’s wedding. Thread a needle and start sewing gems and pearls onto a simple dress. An embellished neckline? Rhinestone sleeves? Welcome! My name is Jessica Hamm and I'm a Madison-based style blogger, jewelry addict, travel lover, and first-time homeowner updating a 1920s house. Follow along for personal style, travel, and lifestyle content. I’m loving these slip-on and wear-with-everything spotted loafers. I’m planning to purchase these pillow shams for our bedroom!